What happens when you combine residential luxury with urban flair? You have the Main Line —200 square miles of suburban Philadelphia encompassing everything your achievements and lifestyle represent. The communities that define the Main Line are home to long-standing generations and to new names looking to establish tradition. Hello! My name is Tyler G. Wagner, Broker/Owner of Wagner Real Estate. Welcome to my online real estate information portal. 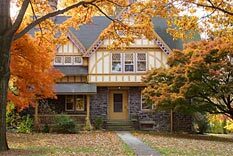 While every pocket of the Main Line has its own unique appeal, let me warn you up front that the one I love most is Havertown in Haverford Township. I grew up in Havertown, which may explain the special place it holds in my heart. My brother, Clay, and I are the 4th generation to serve in our family's real estate agency that was started in 1930 by our great-grandfather. As kids, Clay and I rode our bikes everywhere in Havertown. Today, this serves my clients well, as I know every street (including the bumps in the concrete) and most of the homes. At some point in the 86+ years Wagner Real Estate has been in business, we've probably aided in the sale or purchase of just about every home in Havertown. Because the area began developing at the beginning of the 20th century, you'll find well-established neighborhoods with beautiful tree-lined streets. Many homes are between 50 to 100 years old, although new construction occasionally pops up. In Havertown PA, the homes for sale will most likely be Dutch colonials, red brick colonials, red brick Capes, twins and the occasional split-level, rancher or bungalow. You'll find these authentic styles in neighborhoods such as Chatham Village, Oakmont, Paddock Farms, Brookline and Westgate Hills. Check out my latest Facebook Posts below! Mawr, Wynnewood, Drexel Hill, Bala Cynwyd or Wayne, you could not pick a better place to live in the Philadelphia region. If you're a first-time homebuyer, the time to buy a home is now. Not only are interest rates low, but government-based incentives provide a great opportunity for both you and existing homeowners. As a first-time homebuyer, if you qualify, you can also opt for FHA financing, which allows you to put down as little as 3.5%. If you're an existing homeowner who is ready to trade up, you should know that first-time buyers are driving the market. So not only will you get a low interest rate to help make your next home more affordable, but you also have a market of first-time buyers ready and qualified to buy your home. And don't forget, even if your home value has declined in this economy, the price of the next home you buy will also be less. A 5% decline on a $300,000 house is $15,000. Compare that to a 5% decline on a $500,000 house, which is $25,000. That's a whopping $10,000 difference in your favor when you trade up. Take advantage. complex place. Deciding to put your home on the market can be a hard decision to make. But once you've decided to sell, choosing the best REALTOR® to guide you through the process is vital to your success. Look for someone with whom you feel comfortable and have a good rapport. When you choose me, you get a member of the fourth generation of Wagners who have helped Havertown and other Main Line residents buy and sell real estate successfully. I honestly think the real estate business is part of my DNA, because representing sellers like you in this unique marketplace is what I love to do, and it's what I do best. Wagner Real Estate has 86+ years of success in serving our Main Line real estate clients. When you have me as your listing agent, you get all of that success behind you. Additionally, when I joined the company, I brought extensive knowledge of business process and technology. This was gained from earning my degree in Management Information Systems and further developed from working as an Information Technology Auditor with one of the Big Four accounting firms. When a parent passes on, whether expected or not, it's an experience that forces you to take on many challenges both emotionally and financially. Dealing with inheritance issues—government and probate requirements plus any real estate left behind—is the last thing you want to think about, let alone take on. Because Havertown and the Main Line are home to so many families whose members have lived in the same homes for decades and generations, questions about what to do and how to care for inherited homes and property come up more often than you might expect. This situation is especially difficult for beneficiaries who live outside the region or state. From helping families with inherited real estate early in my career, I realized the importance to them of having a trusted local professional who can walk them through the process of dealing with their inherited property. Thus, estate work became one of my specialties. If yours is a family with an inherited home or property to be managed, sold and/or put in proper order, I can help. Over the years, I've compiled a list of local and reliable tradesman who have the skills needed to prepare and maintain your estate property. My solid relationships with these field workers combined with my expertise in property management and preparing a property for sale ensure your property will be well cared for and market ready when the time comes to sell.